Usable with tokens, this incredible machine of pure fun is made to attract children towards driving a real kart with no risk but a maximum of pleasure. The Sodi KidRacer is designed for easy operation for long hours on the track, as well as in any space dedicated to fun. According to Sodikart’s custom, all models in the Rental range are constantly undergoing changes to remain at the cutting edge of efficiency. The result of the collaboration between the Research & Development department and the rental fleet managers, this ongoing initiative enhances the quality of Sodikart products in every aspect. Apart from the improvement of the manufacturing processes and rigorous selection of materials, the base of the Racing chassis remains similar, but the main novelty of the year concerns the braking system. Directly derived from the one used successfully by the factory team, the 2019 model offers better efficiency in different conditions with the use of several types of pads. The chassis adjustment options have been extended in a simplified way. Very sensitive to the development of the front part of the chassis, Bas Lammers has contributed to the improvement of the 2019 edition which also bears his name. The Offenbach show was also an opportunity to present the new 2019 KZ, RS3 and DD2 liveries. A new, more refined and stylish line, in perfect harmony with the new 2019 clothing collection. Undisputed world leader of Rental karts, Sodikart is also one of the most dynamic manufacturers in Racing. This envied position is earned year after year by a constant quest to improve the quality of products, a permanent goal that guides the work of the French brand. The search for greater agility and performance has guided Sodi’s technical choices in developing the “Sport”. Weight reduction was the priority with a gain of 15 to 20 kg depending on the engine. Always present, the complete protective bodywork has also been lightened to promote greater flexibility in the chassis. The hunt for superfluous parts did not affect the quality standards of the French manufacturer, as evidenced by the steering wheel control for quick adjustment of the pedal position. 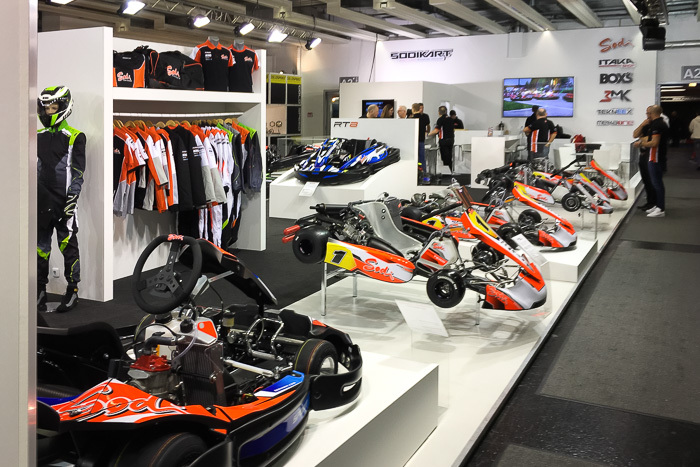 The Sodi “Sport” is the lightest and most powerful sporting leisure kart on the market. It can be equipped with different engines: the four-stroke Honda 270 and 390 or SA 250 or the two-stroke Rotax Junior Max evo and Max evo, for power between 9 and 30 hp. Announced recently, the Sodi KidRacer was demonstrated at Offenbach for the enjoyment of the three to six year olds. Safe and maneuverable, this small electric kart developed entirely by Sodikart has strong attributes to convince the youngest drivers as well as their parents.